One of the fundamental keys to success is the ability to build strong relationships. This includes friends, family, work colleagues and new people I meet. Relationships with leadership, co-workers, suppliers, and customers are important, as they are co-dependent on each other. This is what contributes to action, effective decision making, execution and ultimately success. Without strong relationships, all of the above would come to a grinding halt. A friendly hello, smiling, positive body language and talking about the weather are great icebreakers, but it does go deeper than that. 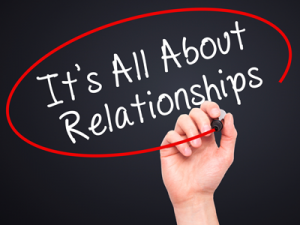 Building meaningful relationships takes time, commitment and strong communication skills. One skill I covet most is active listening. It’s a skill that can take a lifetime to develop and one I practice every day. Without it, achieving my personal and professional goals would be ten times more challenging. Strong communication starts with asking thought provoking questions at the right time with the right person(s). When engaging in a conversation, it’s best to make the topic of discussion about ‘them’. The discussion is rarely about me, my company, my products or services, or how we are better than a competitor. It’s rarely about my accomplishments in life, though I have no issue talking about it. That said, I make every attempt to talk about those things in the context of the discussion with others. The focus is and always should be about the other person. Why? Because I care what they have to say, what motivates them or what challenges they face in their life. You may notice that great communicators do less of the talking and more of the listening. We have all met someone who talks about themselves or simply talks so much that no one else can get a word in edgewise! Often we begin to ‘tune them out.’ The result can be damaging. Simply put, our life-long relationships are about whom we know and whom we trust. Trust must be earned and reinforced throughout any relationship. It’s not a one-time thing! It can take a very long time to build someone’s trust, but it can be lost in seconds when that trust is compromised. Honesty, respect, loyalty, shared values and vision, common goals/objectives, positive attitude and powerful communication skills are the underpinnings of trust. As a Campaign Director for James D. Klote & Associates, I realized quickly that open, honest communication with church leadership, campaign committee leadership, committee members and the congregation as a whole drives the success of any Capital Stewardship Campaign. When people feel they are not included in decisions that shape the future of their church, or feel capital campaign objectives are not presented clearly and concisely, the wheels can go flying off the car pretty quickly. Simply put, our proven process is about inclusion, two-way communication and honesty. This in turn builds trust, which in turn builds powerful relationships. This is why relationships matter! In closing, the growth Klote has experienced is a testament to the relationships we build with our clients – one congregation at a time – one person at a time. I also realized that relationships only get stronger over time – not because we achieved great things together, but because we care about everyone’s success. We hear story after story from our Campaign Directors about the the on-going friendships established at a church when the campaign comes to a close. For me, this is as rewarding as hitting a campaign goal which address the needs of the church. I’m blessed to have those relationships today and cherish them in my heart! 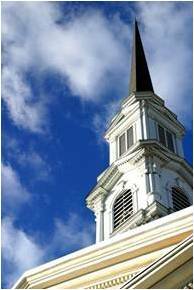 Church attendance is something we talk about at Glory Associates because attendance has a direct correlation with offerings, and offerings are what keep the church lights on, the AC humming during worship hours, and the staff paid. Summer attendance is particularly a topic because church attendance suffers during the summer months. Approximately 400 members and friends of Concordia Lutheran Church gathered on Thursday night for a very special Summer Celebration. Those in attendance viewed pictorial memories from the congregation’s rich history and listened to music while visiting with other members and enjoying drinks and hors d’oeuvres. Located at 505 S. Kirkwood Road in a suburb of St. Louis, this church began its ministries in 1874. Not only a resonant space for Lutheran worship, the church has traditionally provided a home for a variety of community groups.